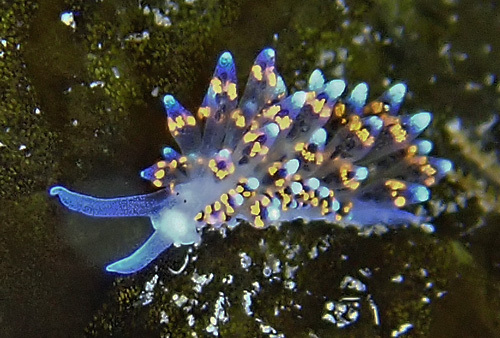 Identification: This striking animal has a translucent body densely frosted with iridescent granules that range from apparently transparent on the notum to blue-white on the rhinophores and the tips of the cerata. There is usually a black-green spot anterior to the pericardium and the branches of the digestive gland in the cerata range from black-green to mottled brown, taking the form of irregular swellings in the tips. Moss-like masses of bright orange tissue (glandular?) form subapical rings in the cerata. The eye spots are closer together than in most species of Stiliger but further apart and smaller than in most species of Costasiella. Natural history: Stiliger sp. #10 is a moderately rare species found in moderately protected to moderately exposed rocky habitats at depths of < 1 to 18 m (< 3 to 59 ft) . They show a diurnal activity pattern while held and the central cerata are readily autotomized. Distribution: Big Island and Maui: widely distributed in the western & central Pacific. Taxonomic notes: First recorded in Hawaii from Maalaea, Maui by PF on Sept. 21, 1989. Photo: PF: 7 mm; central cerata autotomized: found by CP: Hekili Point, Maui; Oct. 23, 1997.